You thought crossovers were lame. That’s what they wanted you to think: that they’re boring, bland, and just useful enough to make almost the entire human population flock to them and dump out loads of cash. While you were fooled, these crossovers were training to take on your beloved supercars. Even in race form, this “R-Tuned” Toyota C-HR looks like something your aunt and uncle would meet you at Cotton Patch for dinner in—reusable drink cups in the holders for who knows how long, the day’s work projects hastily thrown in the back seat because eh, why not, there’s room! That’s what they bought it for. But no, no, no, this C-HR is not as it appears. The crossover has a custom turbo system on its four-cylinder engine that makes 600 horsepower and pulls this thing forward with the front wheels. Toyota even manual swapped the car with a five-speed transmission (because what’s the fun in making production cars you have to shift yourself these days, right?). It was originally a CVT. 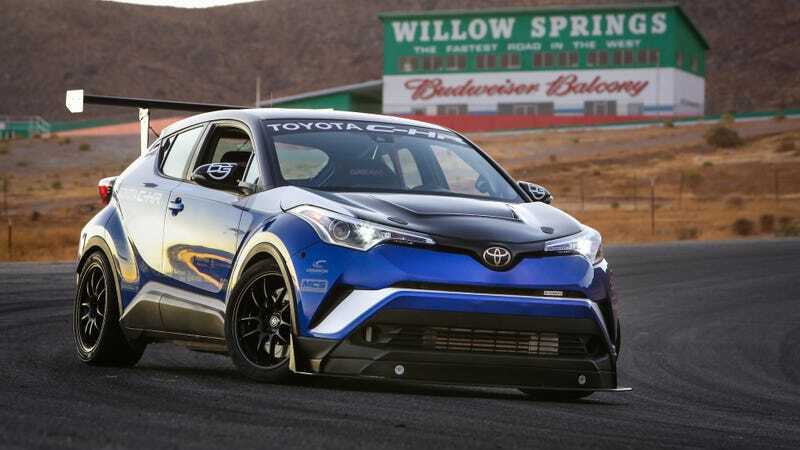 Toyota built this car to be the “world’s quickest CUV,” which doesn’t sound impressive at all, but it actually kind of is: According to Toyota, the C-HR R-Tuned “has turned quicker lap times than a McLaren 650S Spyder, 911 GT3 RS, and Nismo GT-R” at Willow Springs International Raceway’s nine-turn road course. Toyota did not specify if those supercars were giving visitors facility tours or actually trying to set fast laps on the lap times it’s referencing. We live in a world where electric cars will start “singing” to cover up a lack of engine noise and where turbocharged C-HRs can apparently beat Lamborghini Aventadors around a race track. Huh?